The Tupac stunt at Coachella and other grand illusions leave us grasping at thin air. 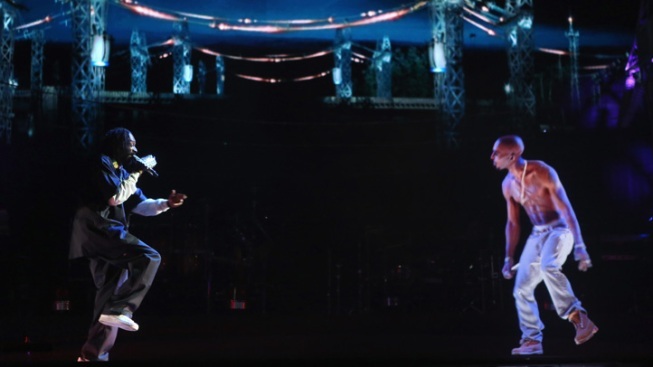 Tupac is back – in the form of a hologram. Five years ago this week, Celine Dion perpetrated a music disaster of near Titanic proportions: her "duet" with a hologram rendering of Elvis Presley on "American Idol." Memories apparently have faded and technology definitely has improved since then, leading the recent "return" of the late Tupac Shakur at the Coachella music festival, where a hologram of the slain rapper "performed" with Dr. Dre and Snoop Dogg. Now there's talk of a Tupac "tour," and digital resurrections of everyone from Marvin Gaye to Jimi Hendrix to Michael Jackson. As much as we'd love to see lost magic recaptured, thoughts of such grand illusions leave us feeling empty. We've reached a point where the line between homage and ghoulishness is becoming as thin and hard to grasp as an astral projection. It's also getting harder to know where to draw the line when it comes to new ways to enjoy the work of departed greats. Natalie Cole's 1991 "Unforgettable" duet with her late father Nat (King) Cole at least relied on the original recording. Ditto for the mid-1990 Beatles "reunion" in which new versions of "Free as a Bird" and "Real Love" were fashioned from tapes left behind by John Lennon. We'll admit to some disappointment last year when Disney cancelled plans for a motion-capture remake of "Yellow Submarine," originally a cartoon in which actors provided the voices of the band members. The Beatles turned up briefly as shadow figures in the Cirque du Soleil show "Love." Cirque du Soleil also has mounted spectaculars built around Presley and Jackson, whose brother Jackie was quoted this week by The Sun, a British tabloid, musing about the prospects of a hologram Michael (if nothing else, the story gave the paper the opportunity to run the headline "Beam it!"). The race to exploit Michael Jackson is well underway, though three decades behind Presley, who is perhaps the most imitated musical figure of all. But at least Elvis impersonators, even the cheesiest of the bunch, are people and not an intangible projection of the real King. There's something in many of us that doesn't want to let go of favorite performers, especially ones like Shakur, Jackson and Presley, who died far too young. There's a temptation in this "Avatar" age to use digital wizardry to recreate what was, but the results bode to be more disappointing than electrifying. Dr. Dre, who helped put together the Coachella stunt, apparently senses the ambivalence. He told TMZ Gaye and Hendrix could be next and wouldn’t rule out a Shakur "tour"– even while later defensively declaring the Coachella performance was intended as a one-off. Scoffing at performing holograms might seem a troglodyte move – even the cave dwellers created their own illusions with shadows and primitive drawings. These days, our cinematic storytellers reap countless millions by giving life to the likes of blue avatars and Gollum, one of moviedom’s most unforgettable characters. In those cases, we’re watching fantasy figures whose motions and facial expressions are provided by living actors who signed up for the gig. Creating holograms of deceased entertainers, who likely never envisioned their images floating in thin air, strikes us creepy and exploitative, no matter what the intentions. We can only imagine a hologram Marvin Gaye asking, in song, "What's going on?"